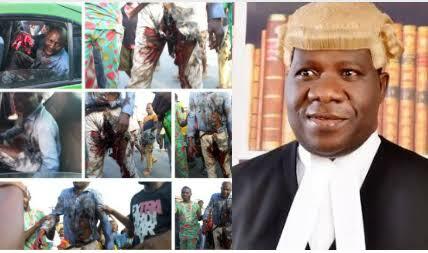 A former member of the House of Representatives, Opeyemi Bamidele, who was shot by a policeman during a meeting of the APC in Ekiti, has been flown to the United Kingdom for further treatment. It was learnt that he was flown in a private jet belonging to a former Governor of Lagos State and National Leader of the All Progressives Congress, Bola Tinubu, on Friday night after receiving treatment at Euracare Multi-Specialists Hospital on Victoria Island, Lagos. Bamidele and five others were shot at a reception rally organised for the APC candidate in the forthcoming Ekiti State governorship election, Kayode Fayemi, at the party’s secretariat in Ado Ekiti on June 1. He was flown to Lagos last Sunday in an air ambulance after doctors at the Ekiti State University Teaching Hospital, Ado Ekiti, extracted two bullets from his abdomen and leg. A source told Punch that Bamidele was flown to the UK on the insistence of Tinubu that he be exposed to treatment in line with best global practice. Recall that Bamidele served as a Commissioner for Information and Strategy under Tinubu. “He (Bamidele) had started cracking jokes at the Ekiti State University Teaching Hospital, Ado Ekiti, where a surgery was performed on him before he was flown to Lagos for further treatment,” the source said. Bamidele’s media aide, Ahmed Salami, confirmed that his principal has been flown abroad for “post-surgery management”. He also dispelled the rumour that Bamidele was flown abroad because of fears over his health.